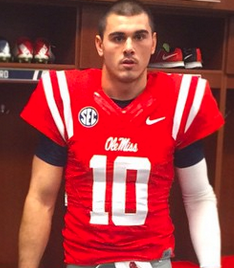 Ole Miss names Chad Kelly starting QB for season opener. Sunday, April 21, 2019 • R.I.P. Edition • At least we're not Multiversity! Chad Kelly. Img. via Saturday Down South. Scratch one more quarterback controversy off the books - for now at least. Ole Miss head coach Hugh Freeze has named Chad Kelly as starting QB for the Rebels' season opener against Tennessee-Martin on Saturday. Freeze says that he doesn't know whether Kelly, who has competed for the starting job with fellow QB's Ryan Buchanan and DeVante Kincade, would continue as starting QB past Saturday. Kelly, the nephew of NFL Hall of Fame QB Jim Kelly transferred to Ole Miss following a season at East Mississippi Community College. He had previously attended Clemson, but was dismissed in April of 2014 for the ever-vague "conduct detrimental to the program." In January, Kelly pleaded guilty to non-criminal disorderly conduct charges related to an incident at a bar in Buffalo, NY a month earlier. He had to perform 50 hours of community service. Ole Miss will play Tennessee-Martin at home on Sept. 5.